국내외 언론에 보도된 KDS 관련 기사입니다. 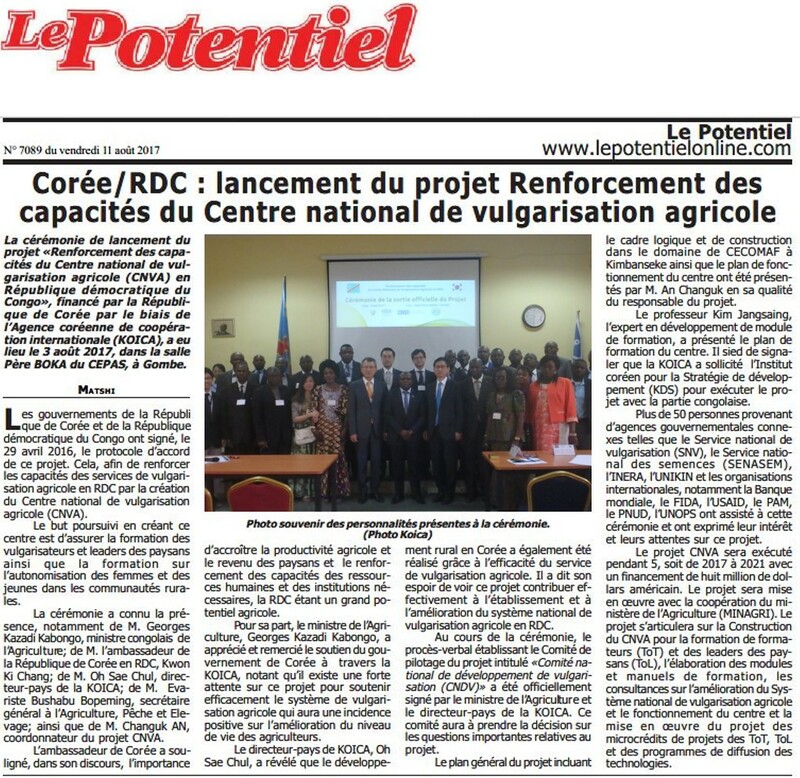 The Launching ceremony of the project entitled “Capacity development of National Agricultural Extension Center (hereinafter NAEC) in the Democratic Republic of Congo” funded by a bilateral grant from the Republich of Korea through Korea International Cooperation Agency (hereinafter KOICA), has been held on 3rd August 2017, in Salle Père BOKA, CEPAS. The Governments of the Republic of Korea and the Democratic Republic of Congo signed in 2016 the Record of Discussion for the project in order to enhance agricultural extension service in the DRC by improving the national agricultural extension system and establishing the NAEC for training of trainers and leaders. It is expected to contribute to stabilizing national extension system in the DRC as well as to enhance the capacity of agricultural extension agents, leaders of farmers’ cooperatives, women and youth in rural communities. The ceremony was punctuated by the presence of the following dignitaries: Ambassador of the Republic of Korea in DRC, His Excellency Mr. KWON KI CHANG, the Minister of Agriculture, His Excellency Mr. GEORGE KAZADI KABONGO, the Country Director of KOICA, Mr. OH SE CHUL, the General Secretary of Agriculture, Fisheries and Liver, Mr. Evariste BUSHABU BOPEMING, the Advisor of Minister of Agriculture, Mme. DENISE BOLIGO, the Project Manger of Implementing agency, Korea Institute for Development Strategy (KDS), Mr. CHANGUK AN, the Korean expert in Curriculum development from World Canaan Farmers’ Movement (WCM), Mr. KIM JANGSAING. In his congratulatory remarks, Ambassador of Korea, His excellency Mr. KWON KI CHANG emphasized that it is important to increase the agricultural productivity and rural income through capacity development of human resources and institutions since DRC has a great agricultural potential. The Minister of Agriculture, His Excellency Mr. Georges KAZADI KABONGO gave his speech, appreciating the support of the government of Korea and KOICA as there is a high expectation on this project to efficiently support the agricultural extension system which will positively affect on the improvement of farmers’ lives. The country director of KOICA, Mr. OH SE CHUL informed that the rural development in Korea has been also achieved through the efficient and successful agricultural extension service and express his hope that this project can contribute to establish and improve the national agricultural extension system in DRC. During the ceremony, the Project’s steering committee entitled “National Extension Development Committee (NEDC)” has been officially launched by the Minute of Meetings signed by both Minister of Agriculture and the country director of KOICA. This Committee will have a role of decision makings on the important matters related to the project during the project period. The Implementing Agency, Korea Institute for Development Strategy (KDS) and World Canaan Farmers’ Movement (WCM) have presented the overall plan of the project. Mr. AN CHANGUK, the project manager, presented the construction plan for the center which will be established in the area of CECOMAF. He also gave the presentation about the plan for legislation and operation of the plan. Prof. KIM JANGSAING, the expert in curriculum development, presented the plan for the training of the center. Lastly, Mr. AN informed about the project implementation structure and its logical framework. More than 50 persons from related governmental agencies such as SNV, SENASEM, INERA and international organizations including World Bank, IFAD, USAID, WFP, UNDP, UNOPS have attended this ceremony and expressed their high interest and expectation on this project. This project which is started this year will be implemented until mid 2021, under cooperation with Ministry of Agriculture (MINAGRI). The project is composed of 1) Construction and rehabilitation of National Agricultural Extension Center (NAEC) for Training of Trainers (ToT) and Training of Leaders (ToL), 2) Development of curriculum and textbooks, 3) Consulting on improved national agricultural extension system and legislation of NAEC, 4) Establishment of Center operation plan and capacity building for it, and 5) Implementation of ToT, ToL and technology dissemination projects.